Fiocchetto is a sophisticated Carrara marble side table with golden metallic structure. This square shaped small table is the perfect accessory to update your sofa or complete a vintage style armchair. Fiocchetto is a modern marble side table made with Carrara white marble and a squared golden metal structure. The base features a minimalist design adorned with blue woven leather inserts. Fiocchetto is an exclusive designer side table made by Italian brand Amerigo Milano that specializes in luxury furniture and accessories. This small table features an exquisite Carrara marble tabletop and gold frame. Fiocchetto is a square marble side table. A modern addition to any stylish living room, it features a golden metallic frame with green woven leather inserts and a pure white Carrara marble top. Fiocchetto is a white marble small table suitable as a sofa side table or nightstand. Made with an exquisite Carrara marble tabletop, it features a golden metal structure that gives a shiny touch. Stylish Dark Emperador brown marble side table, Fiocchetto features a shiny squared structure made with polished galvanized metal in gold finish. Suitable as an accent coffee table or an unusual nightstand. 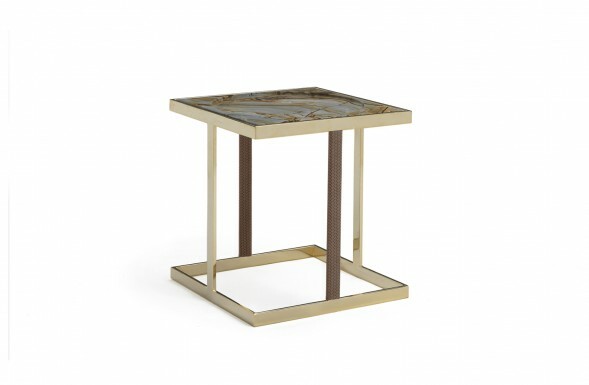 Fiocchetto is a statement piece, a high end side table made with Dark Emperador brown marble top placed on a polished golden metallic frame. Every piece is handmade in Italy, by skilled artisans based in Milan. Fiocchetto is a sophisticated golden side table for stylish living rooms. Inspired by art deco style, it incorporates the current metallic trend and Dark Emperador brown marble. Fiocchetto is a square luxury side table, the ideal solution for stylish living rooms. The sleek golden structure is adorned with leather inserts in a trendy pale green and topped with a brown marble slab. The Fiocchetto decorative side table features a metal frame with an exquisite marble top. Its luxurious design combines a traditional material with a polished structure with beige leather inserts. Roma Imperial quartzite side table Fiocchetto is a high-end accessory to match designer sofas and armchairs. The contrasting colouring of the Roma Imperiale marble is absolutely stunning. Beautiful and functional accent piece, Fiocchetto is a marble top accent side table with luxe finishes that fuses heritage inspirations and on-trend design elements such as a minimalist metallic frame. Introduce a refined look to your living room via this luxury side table with marble top and polished metallic frame. It provides a beautiful surface for a designer lamp, books, magazines, decorative objects. A polished metal framework and a marble tabletop combine to create this contemporary side table. A sophisticated accessory for elegant living rooms, 100% Made in Italy, artfully handcrafted in Milan. Fiocchetto is a marble and gold side table with squared top and geometric sleek frame. A must have accessory and a functional solution, a small table can be used as a handy surface in your living room.